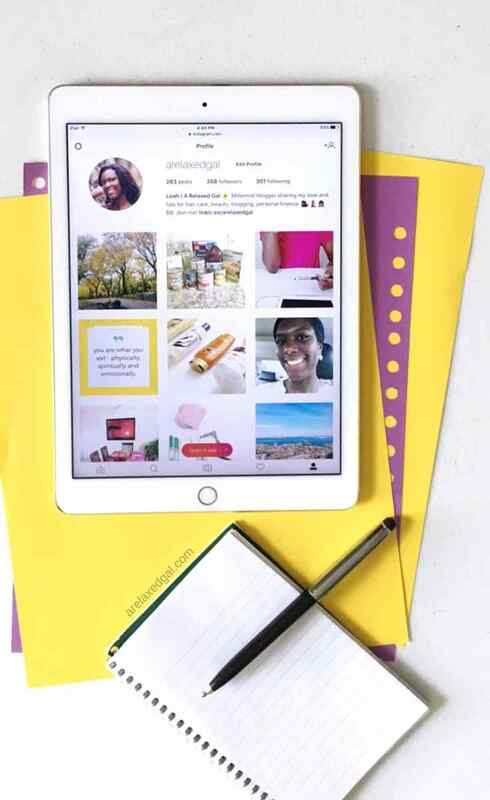 I’ve seen many questions in blogging groups about whether it’s a good idea or not to switch to business accounts on Instagram. There are a few differing thoughts out there, but it seems like the consensus in the blogging groups and among the bloggers I follow is yes it’s worth giving it a shot. You get access to insights and data that you can't get anywhere else, at least not for free, including a personal profile. This one is new, you can schedule your images to automatically post. The analytics information is available for stories, photos, videos, and carousel posts for the past year, two years or even three months. This is great information because you’ll be able to see what type of work best for your followers and then tailor for your future content accordingly. And the information is also helpful for creating a posting schedule that gets you the greatest amount of engagement. The analytics that Instagram provides is broken into three buckets - Activity, Content, and Audience. How many times your Instagram profile was visited and viewed. How many times the site link in your profile was clicked. This is how many times your posts are seen. Shows how many unique accounts or profiles saw your post. 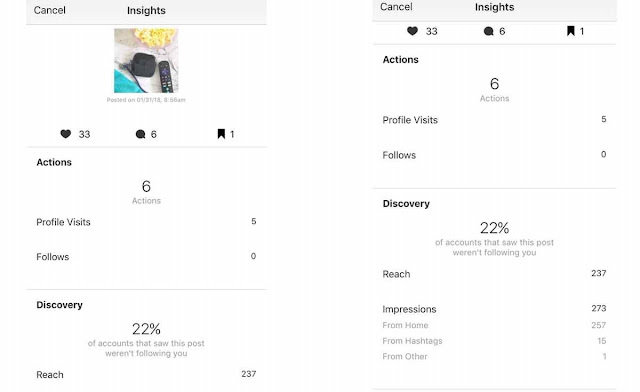 In this section, you can see how your feed posts and stories are performing. Such as the number of times people engaged with each of your feed posts by liking, saving and commenting on it. You can also see how many views your stories have received and whether people clicked forward or backward. 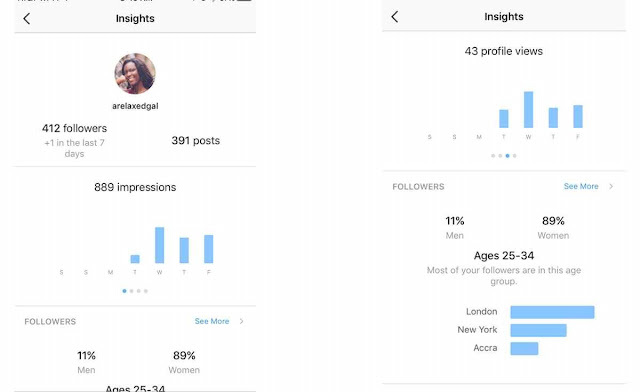 Here you can see how many new followers you've gained, the demographics of your followers (gender, age, and location), the days of the week and the average time of day your followers are most active on Instagram. If you're really into the numbers and want to know how each of your posts performed individually and how they were found. All you have to do is select one your posts and then click the View Insights link beneath the image. There you get a summary of the number of likes, comments, and saves the post got, How many profile visits and follows it generated for you. You can see what percentage of people who saw the post weren't one of your followers and how your post was discovered. On January 30, 2018, Instagram announced they were updating their API to allow business profiles the ability to automatically post to Instagram via approved 3-parties or Instagram Partners. This is a game-changer. Prior to this change, there wasn't any automatic posting Instagram that was Instagram approved. To schedule your posts you could use a 3rd-party app to create the post and you would get a notification at the time you scheduled to remind you to post. This was a bit time consuming because you were technically creating the post twice. First in the 3rd-party's platform and then again on Instagram. Even though Instagram is now allowing auto posting there are some limitations outside of needing a business profile. Additionally, you'll not be able to auto-post videos, carousels (multiple images for one post) set a location tag or tag users. Hootsuite seems to have been the first 3rd-party platform to offer the automatic posting with other tools like Planoly and Tailwind soon following suit. 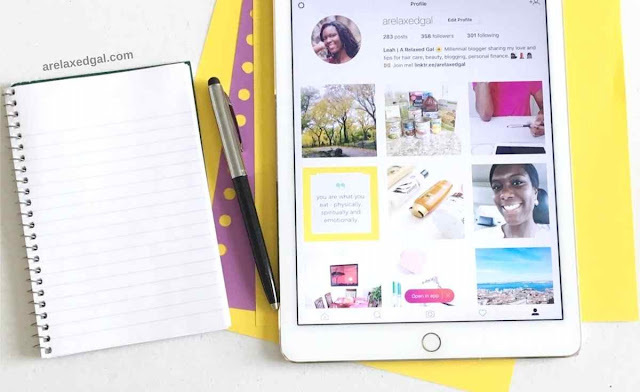 With both of these tools, you can schedule your Instagram posts and let them do the posting for you. Hootsuite currently has a free plan that allows you to schedule up to 30 messages. Tailwind on the other hand only has a paid plan for $9.99 a month though you can get a free trial when you use my affiliate link. Planoly is one of my favorite Instagram scheduling apps and they also have auto-posting that is available in all of their plans. Including the free one. You have the option of adding a call, text or email call to action button for followers. You can also add other contact information such as an address, though that is more beneficial for businesses that have physical locations. Like with your posts on Facebook Pages you can easily select well-performing posts and do some paid promotion for them. The cool thing about this is Instagram will provide a targeting suggestion for you based on who engaged with that post. You can tailor that targeting as well as the budget and length of time for the post promotion. This is great if you want to use Instagram to drive more site traffic or newsletter sign-ups. The ability to moderate your comments which includes being able to turn commenting on and off. If you have a business profile and over 10,000 followers you can add links to your Instagram Stories. This can be helpful for driving traffic directly to blog posts or YouTube videos you promote in your stories. 1. First off you need to have a Facebook Page. Not a profile, but a page like other businesses and brands do on Facebook. 3. Update your business contact information by adding an email where your followers can contact you. You can also add a phone number and address if you desire. Since switching I’ve been enjoying having a business profile on Instagram because of the insights I get. I love having info on what posts are resonating with my followers and which aren't. Before I switched to the business profile I was just basing success on how many likes the post got which didn’t tell me much. Now I know which posts get more impressions, have a greater reach and my followers engage with. I’m able to take that information and then model future posts off of the top ones. Additionally, I get information on my followers, such as gender, age, and location. This info is good if looking to do sponsored Instagram posts as brands like to know they are reaching their preferred audience. The follower info can also be helpful for creating ads. If I decided to create Instagram ads I could set my ad targeting using my current audience data. Included in the follower data is info on what days of the week and time of day my followers are active on Instagram. I can use this information to decide when I post so I get the most reach and engagement. The insights will take a few days to populate. Data on posts didn’t start populating my insights page until my first post after I switched to a business account. Have you switched to a business profile on Instagram?